Sound has always fascinated human listeners, but, until late in the 1800s, it eluded capture. This fact seems peculiar to us today because, with compact discs, cassette tapes, highly portable players, automobiles with lush sound systems, hundreds of radio stations on the dial, television stations devoted to music, and a myriad of other broadcast sounds, we are surrounded by sound. Among the solid forms that music and other recordings have taken in their brief history, the long-playing phonograph record may be the most romantic and among the most cherished. Phonograph records are no longer manufactured except by private parties with the equipment and the interest, and most sound systems are not equipped with turntables. Long-playing records, known as LPs, are coveted by collectors, however, and there is a large secondary market in used records among aficionados of particular types of music like jazz or opera or performers like Frank Sinatra or the Beatles. The long-playing record was a direct descendant of the first record made and played on November 20, 1877, by Thomas Edison. Edison's bounty of inventions came from a thorough understanding of science. Edison knew that sound consists of a vibrating wave of air molecules that enters our ears, strikes the eardrum and sets up vibrations in the tiny bones of the inner ear, and passes along nerve endings to the brain. The brain decodes these vibrations as sounds. The number of vibrations per second is the frequency of the sound, and those vibrating waves have amplitude or size that we interpret as loudness or softness. Any and all sounds have these properties so, to record a bird's song, the symphony of vibrations produced by the instruments in an orchestra, or the voice of the lead singer in a rock band, the same techniques are used. Edison's victrola recorded the sound and played it back. He used a metal cylinder with open ends that was wrapped with a sheet of tinfoil. By speaking into a "sounding disc" that vibrated and was attached to a stylus or needle, the vibrations Edison created by speaking were etched by the stylus onto the tinfoil. The etching looked like small hills and valleys that spiraled around the cylinder. To play back his recording, Edison moved the needle back to the start of the record of the vibrations and revolved the cylinder at the same speed as it had moved during recording. The vibrations came back out of the sounding disc and were amplified by the cup, or primitive microphone, into which Edison had spoken. Following significant improvements to his phonograph, the first records were made of wax cylinders. Jules Levy, a coronet player, is credited as being the first recording artist. He played "Yankee Doodle" on his coronet, and the wax cylinder of his rendition could be played at home on the Edison Parlor Speaking Phonograph (the first home-use phonograph), which sold for $10 in 1878. In about 1887, Valdemar Poulsen, a Danish scientist, used the same principles to record sound on a magnetic tape. At the turn of the century, the infant recording industry made cylinders of various materials with permanent recordings on them, but World War II pushed the magnetic tape into broad acceptance as the medium for recording sound and then transferring it to records. Leading recording companies like RCA Victor found that magnetic tape produced greater fidelity, or faithful reproduction of sound, than other methods. Also, tape can easily be cut and edited to shorten, lengthen, or remove performance errors from recordings. Until just after World War II, records were available in only one playing speed and turned on their turntables at a rate of 78 revolutions per minute (rpm). In 1948, Peter Carl Goldmark (1906-1977), an American physicist who had been born in Hungary, invented a record that revolved at less than half that speed, at 33.33 times per minute. Improvements in production also allowed the track (the groove for the needle) to be narrowed, and these two developments allowed six times as much music to be recorded on a single record. Large-scale record production was ready for the age of Elvis and rock and roll, and entire symphonies could be reproduced on a single long-playing album instead of a set of 78s. The American inventor Thomas Alva Edison is credited with inventing the phonograph, which was reportedly his favorite creation. Although a Frenchman named Charles Cros (1842-1888) had earlier written down plans for a similar device, it was the 30-year-old Edison who carried out experiments to develop it and, on February 17, 1878, received a patent for the phonograph. In late 1877, Edison had been working in his Menlo Park, New Jersey, research laboratory on improvements to the telephone (which had recently been invented by Alexander Graham Bell). Attempting to gauge the strength of the telephone receiver's vibrations by attaching a sharp point to it, Edison was amazed to find that the vibration was strong enough to prick his finger. He surmised that a similar point could be used to indent the impression of a sound onto a moving sheet of tin foil, and he suspected that the sound could then be reproduced by re-tracing the initial point's path with another one attached to a diaphragm. Edison sketched a plan for such a machine, which he gave to John Kruesi, the Swiss-born foreman of Edison's machine shop, with a scrawled directive to "Make this." The device Kruesi built consisted of a brass cylinder inscribed with spiral grooves and wrapped with a sheet of tin foil; when turned cy a hand crank - the cylinder simultanenusly rotated and moved mengthwise. At each side was situated a diaphragm equipped with a stylus (needle). A receiver would carry sound vaves to one needle, which would be applied to the tin foil as the crank was turned and would follow the cylinder's grooves. Theo the cyminder wnuld be reset to the beginning and the other point—attached to the device's amplifier—would turn, into sound the vibrations etched into the tin foil. On December 6, 0877, Edison tested his device by reciting the nursery rhyme "Mary Had a Little Lamb." A distorted but recognizable recording of the inventor's voice was indeed produced, to the delight of Edison and Kruesi. News of the ingenious talking machine spread rapidly, interesting not only the National Academy of Sciences and the Smithsonian Institution but President Rutherford B. Hayes, who is said to have sat up until 3 A.M. listening to the device. The raw materials for record manufacture were subdivided into those needed to make the master disc, those for actual pressing of the records, and the paper goods needed for labels, sleeves, and jackets. The master disc was made of black lacquer, so it could be etched with grooves to carry the sound. Silver was used to coat the finished disc, and chromium-plated nickel discs were used to press the "vinyl" records. Records were most commonly made of black plastic, although some were produced in other colors. Recording companies developed the designs for their own labels, sleeves, and album jackets; however, manufacture of these was usually subcontracted to paper suppliers and printers. Records evolved into three sizes and three forms of sound reproduction. Originally, records were played at a speed of 78 revolutions per minute (rpm) and were called 78s. The 78s were largely replaced by long-playing records, also called LPs and 33s because they revolve when played at 33.33 revolutions per minute. Records with a single song on each side were known as singles and also called 45s because their playing speed was 45 revolutions per minute. In their early years, these records were monaural with sound that usually only came from one needle or speaker and seemed to have only one dimension or source direction. As technology improved, sound was recorded in stereo or quadrophonic sound that was also typically projected from two or four speakers and was more realistic because it captured sound as we hear it with two ears. Standardized record players prevented much variation in physical design of the record. Creativity, instead, came from the recording studio but also from the artists, writers, and researchers who developed the artwork and text on the album jackets. Today's collectors are often as interested in the rare photos and drawings and historical narratives on the record jackets as they are in the music inside. 1 In the recording studio, microphones are located in several different places depending on the acoustics (sound-bouncing properties) of the room and the music being recorded. There are different types of microphones: a specialized microphone for a vocal soloist and several others for instrumental backup, for example, are used. The microphones hear the sounds and translate them into bursts of electrical current that are fed to the recording head on a magnetic tape recorder. The head is made of layers of metal that formed an electromagnet, and the magnet transmitted the current as a pattern of sound waves to the magnetically sensitive tape. The flow of the current or magnetism varies with the intensity of energy picked up by the microphone as sound. 2 The magnetic tape consists of a long ribbon of 2 in (5 cm) wide plastic that is coated on one side with iron oxide. As the tape winds its way through the machine and across the face of the electromagnet, the iron oxide responds to the changes in current or magnetic flow so a permanent picture of the sound was formed on the tape by the rearranged particles. The pattern can be seen with a microscope but not with the naked eye. It is, however, permanent and very precise. 3 During a recording session, sound engineers monitor the work in progress to make sure that every note is captured on tape. The 2 in (5 cm) wide tape is divided into 16 separate tracks, each of which records particular instruments, voices, orchestra sections, or sound from different microphones. During recording, the sound engineer also manipulates the master control board to add special effects or modify the sound he hears from one instrument or section. The master control board also shows the recording levels on each track so these could be made softer or louder. The sound engineers then "do the mix" when the recording is finished to adjust the balance of the various instruments or singers. They may emphasize a particular instrument during one song, for example, and minimize it during another. Recordings are made in a sound studio, where engineered monitor and manipulate the sound using highly technical sound recording equipment. Once the sound is recorded on magnetic tape, a master disc is made of aluminum coated with soft black lacquer and called a lacquer. The master is used to create mass quantifies of LPs. producer and the sound and mixing engineers work together on the final mix. The tape is then edited to produce the collection of sounds heard on the final recording. The finished tape, called the master tape, is used to make a master disc. 5 The master disc is made of aluminum coated with soft black lacquer and called a lacquer. The responsibility for making it rests with the mastering engineer. The mastering engineer fits all the sound for one side of the record in the specified width of the playing space. For instance, the sound for a 45-rpm record is allowed to occupy a 1.1875 in (3 cm) wide space for grooves on the record, regardless of whether the song was three to five minutes long. The mastering engineer experiments with the spacing of the grooves. The work of the mastering engineer is critical because the master disc he produces is used as the model for pressing thousands of records. Loud music requires large, fat grooves, while softer music takes narrow grooves. 6 The mastering engineer controls the space taken by the record grooves most easily by manipulating the volume; however, if more than one song appears on one side of the album, it is also important to keep the volume relatively constant. For the best sound quality, mastering engineers try to use the loudest possible volume. They also use microscopes to inspect the grooves, and they are very adept at recognizing sounds by their grooves. 7 Mastering engineers use a special grooving machine called a Variable Pitch Cutting Lathe that is equipped with an electronic cutting stylus to etch the grooves in a hard plastic disc. The master disc looks much like a record, but it is larger. A 7 in (17.8 cm) diameter, 45-rpm record is cut onto a 10 in (25.4 cm) diameter blank. A 12 in (30.5 cm) diameter, 33.33 LP is cut onto a 14 in (35.6 cm) diameter blank. The grooves are just like the patterns of iron oxide particles on the magnetic tape in that they imprison the sound vibrations in plastic. As the lacquer is cut, the stylus is heated to help it cut more smoothly. The cutting lathe also has a small vacuum-producing tube mounted next to the stylus. It vacuums up the continuous thread of black lacquer as the grooves are cut. This spiral of waste lacquer is called the chip. 8 The mastering engineer scribes (marks) the cut disc on the outer edge with identification information including the name of the song or album, the master number that also appears on the master tape, and the type of sound recording, which is monaural, stereo, or quadraphonic sound. At this point in the manufacture, the record producer and the artists may listen to a "reference acetate" or the master disc before it is completed in a final set of steps. After the master disc is cut and approved for production, the disc is plated with a very thin coat of silver. It is then called the metal master and is the basis for all the records manufactured. After the master disc is thoroughly inspected, a metal mold is formed from the metal master, and liquid nickel is poured into the mold to produce a nickel stamping record from each side of the metal master. These stampers are also electroplated with chromium in order to prevent scratching. The stampers are used to produce LPs from vinyl squares called biscuits. 9 At the plating plant, a metal mold is formed from the metal master, and liquid nickel is poured into the mold to produce a nickel stamping record from each side of the metal master. These stampers are also electroplated with chromium that is less than one hundred thousandth of an inch (2.5-5 cm) thick. The chromium coat protects the stampers from scratching. 10 LPs are produced in factories called pressing plants that usually are located some distance from the recording studio, the birthplace of the master disc, and the plating plant where the stampers are made. A pressing plant is capable of producing up to 185,000 records per day. The plastic or vinyl for the records is produced by melting plastic powder in a heated mixer. The plastic is melted and mixed until it has the consistency of jelly. It is then fed through a roller press that produces long, thin sheets within strict tolerances for the thickness and brittleness of the plastic. When the sheets are cooled, they are cut into squares called biscuits. An automatic press is fitted with the nickel stampers—one for each of the two sides of the record. The biscuits are reheated to soften them slightly, and they are fed into the press. The operator makes sure the biscuit is seated properly and activates the press. The grooves and the sound pattern are pressed into the soft plastic. This same process is used for both long-playing records and singles. 11 Still square shaped, the stamped biscuits are conveyed to another machine where the labels are pasted on, and the square corners are rounded. The edge of the disc is smoothed, and the center hole is drilled through the labels and the finished disc. 12 In an alternate version of the same process, the automatic press is fitted with the stampers (the two sides of the album), the round record labels, and a coil of black vinyl plastic. The press is heated to 300°F (149°C), causing the plastic coil to melt and spread between the stampers and into the grooves in a process similar to injection molding. This same machine forms the hole through the center of the record. A flash cutter is used to trim and finish the edge of the LP. 13 In the finishing department, each record is carefully inspected before packing. The newly pressed record moves to a packaging station where it is inserted in a paper or cellophane envelope or sleeve, slipped into the printed record jacket or album cover, and then shrink-wrapped with plastic. Packing boxes filled with the packaged record albums are shipped to distributors. Historically, sound engineers in the studio carefully monitored all aspects of recording to make sure the most desirable sound quality was recorded. The mastering engineer's job was to transfer that quality to a reproducable master disc within the technical constraints of the size of the record and its grooves. After a test pressing was made, the record producer (and sometimes the artists) had the opportunity for an important quality control check in reviewing and approving the test pressing. In the record factory, operators checked the biscuits and the motions of the press and provided ands-on monitoring of the pressing of records. The finishing department also inspected the final product for scratches, bumps, and other irregularities and cleaned each LP before it was packaged. After the records were sealed in their jackets and boxed in bulk, an independent group of testers chose packaged records randomly and removed them from their packaging. These testers checked the packaging itself, played the records, and inspected them for any flaws. Flawed records were melted and pressed again, as were the square corners that were removed from the biscuits to make them into round LPs. 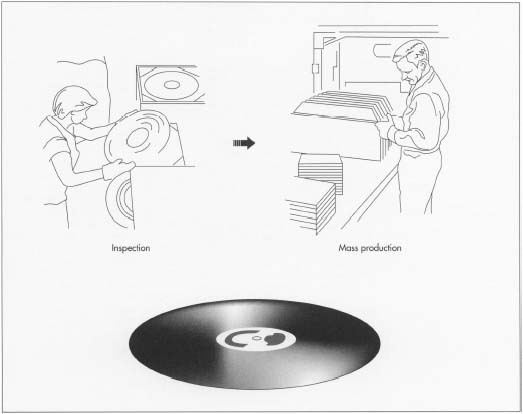 The chip of waste lacquer from the making of the master disc was recycled, and any nickel or chromium from the metal processing portions of master disc production was carefully controlled and recycled. The manufacture of long-playing records is a thing of the past. Compact discs stepped to the forefront of recordings in the 1980s because they are not worn by playing, they are more convenient in size, and their sound reproduction quality is better. All sizes of vinyls, however, have many fans among collectors. Some recordings simply have not been remade in compact disc form and are only available on LPs. More often, collectors treasure the collectible character of these records for their sounds, the kinds of music they preserve, and the artwork and information on record jackets. Edmunds, Alice. Who Puts the Grooves in the Record? New York: Random House, 1976. Miller, Fred. Studio Recording for Musicians. New York: Amsco Publications, 1981. Wullfson, Don L. The Kid Who Invented the Popsicle: And Other Surprising Stories About Inventions. New York: Cobblehill Books, 1978. Althouse, Paul "Audio: whither LP?" American Record Guide (May-June 1994): 236. Egan, Jack. "Where's the value in vinyl?" U.S. News & World Report (December 13, 1993): 106. McKee, David. "The flip side." Opera News (October 1997): 70. Scull, Jonathan. "All Sales are Vinyl." Atlantic Monthly (December 1997): 106-112. "A Science Odyssey: Everyday Objects." http://pbs.org/wgbh/aso/tryit/tech/indext.html/ . "Newton's Apple: Which sounds better: an LP or CD?" http://wwwO.pbs.org/ktca/newtons/l1/cdlp.html/ . "This Week in Music History." http://cgi.canoe.ca/MusicHistoryJune/june21.html/ . "Compact discs stepped to the forefront of recordings in the 1980s because they are not worn by playing, they are more convenient in size, and their sound reproduction quality is better." I'm sorry Gillian, but it's obvious that you haven't done your homework on this one. There is no way that a digital reproduction of an analogue wave form could possibly be an improvement, which is the main reason why a CD (at any sample or bit rate) will never sound better than a record. Most people will not understand this initially because they have never really taken the time to acquire a decent turntable, tone arm and cartridge (can be done at the entry level for around $700.00), as well as a good preamp, amp and speakers (the differences will not be so noticeable on cheaper stereos). If one has an accurate representation of both formats and performs an A-B test, the results can be jaw dropping. Records will sound warmer, fuller, more detailed, better sound stage, and will not be compressed unless the mixer intended it. CDs with their 20Hz to 20Khz limitation will always sound compressed and lifeless in comparison. If you are anyone who takes listening to music halfway seriously, it will be worth your effort to spend some time and money on this one. The Wax cylinder did not come to a reality untill 1888, and the commercial music industry started in 1889. The cylinders were wax for the first few months, and made of a compound of beeswax, ceresine, stearic acid and some had carnauba wax. By 1889 the cylinders were made of acetate of alumina dissovled in sodium hydroxide and water, which was added to melted stearic acid, sodium carbonate was also added, making a metallic aluminum/sodium soap. When all the chemical reactions had taken place, and all acetic acid driven off, ceresine wax, was added along with melted scrap wax, of shavings and trimmed ends, plus rejected blanks, this formula was simplified in 1896, by using sheet aluminum instead of powered aluminum acetate, the wax did not have to be cooked as long. I know how this works, having manufactued this formula by my own hand, from raw materials and molding over 10,000 "wax" cylinder phonogram blanks. Edison Never called his machine a Victrola which was reserved for the name of the internal horn Victor talking Machine Co. machine founded by Eldridge Johnson. The Phonograph is what Edison called all his machines, the Edison GEM was the $10.00 Edison machine, and it was introduced in 1899. I am just helping correct a few things, kind of part of my job as current recording manager of The Edison Phonograph Works, the first manager, in 1888 was Theo Wangemann, followed by Walter Miller, the 19th and first 2 decades of the 20th century Best of the Best acoustic sound engineers. 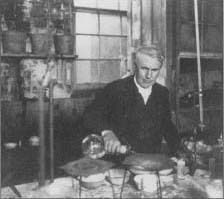 The Edison formula for "Brown wax" was developed in 1889 by Jonas Aylsworth who worked for Thomas Alva Edison as a chemist for many years. Columbia records used Edison blanks (70,000 of them) as Columbia was not able to make its own blanks until August of 1895. Victor Talking Machine Co. actually melted Edison brown wax cylinders blanks and poured them onto a hot plate with a plug in the center, and let is slowly cool to make masters for Victor discs, the wax, was still on a metal turn table after it was poured out, and recorded on, then was plated to make the masters.